After clipping away some fur and cleansing the skin, several electrode patches are adhered to the skin over the right and left chest areas and along the sternum. The Holter monitor is a small digital unit with a main cable and 7 wires. The wires snap onto the electrode patches. It is then wrapped up with soft bandage materials around your pet’s ribcage. If an appropriately sized vest is available, your pet will be outfitted with a vest over the wrap. The technician will communicate with you on the removal procedure. A daily log will be your homework. 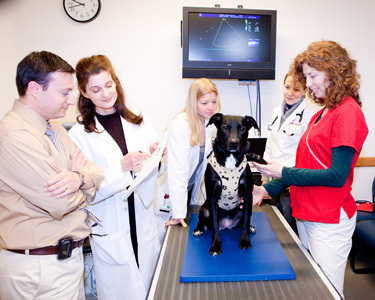 Recording your pet's activities during the 24 hours is extremely important and will help correlate daily activity with the heart's rhythm and rate. The ECG data is not sent out to a human medicine lab but is meticulously edited by our cardiology technical staff and reviewed and interpreted by the clinicians who will make therapy recommendations based upon the results.